Sometimes you just crave the unexpected. That is why we looked far and wide for those chocolate clubs that truly delivered the unique, extraordinary selections that you cannot find elsewhere. From intriguing ingredients to one-of-a-kind concoctions, the confections you receive from these clubs is sure to impress. This club is by far one of the most unique that we have ever seen. You can choose three months (and preview the selections for those months) and receive fun, out-of-the-box concoctions. Just some of the interesting selections you will find include champagne truffles, caramel marshmallows, exotic truffles – which include ingredients like Hungarian paprika, sweet churned cultured butter ganache and sea salt, Chinese star anise with absinth and dark chocolate, and Australian macadamia nuts with coconut. They even include a bacon-inspired chocolate bar. If you select the Collezione Italiana for one of your moon months, you will receive truffles created from artisanal ingredients, including Taleggio cheese, fennel pollen, Tahitian vanilla and bittersweet chocolates of Italy. Vosges is surprisingly affordable considering the quality of their ingredients and the selection you get in their monthly club. The membership starts at $139 for three months and shipping is free. Can’t wait for their memberships to come available? They have limited spots, only making it more intriguing, but if you cannot wait for one to open, you can purchase some of these exotic ingredients straight from their online store. Dear Coco is one of those chocolate clubs that is devoted to the world traveler – so you know you are going to find something out of this world here. They offer monthly specials that cater to seasonal as well as global tastes. Just some flavors that have been highlighted included those from Barcelona, Shanghai and even Istanbul. Their British Collection is fun with Earl Gray tea integrated into the chocolate recipe. Dear Coco also offers dairy-free and gluten-free options for those that have Celiac or are on vegan diets – something that most chocolate clubs cannot boast about. Their membership is a truffle of the month collection with some of the most exciting ingredients you will ever find in chocolate. The 3 Month East Coast Membership includes a 12-piece truffle box each month for three months starting at $125 and free shipping. Do you live on the west coast? If you live on the west coast, you will have to sign up for the 3 Month West Coast Membership, which increases the price to $155 total for three months. Intrigue Chocolate Co.’s Truffle of the Month Club has a few unique aspects – and of course, exotic flavors to enjoy. Most of their chocolates are inspired by the season, which means you are unlikely to find the same chocolates more than once with this membership. This is one of the few clubs that makes it clear they use a very simple ganache recipe with limited sugar – because they want to highlight the natural flavor of the chocolates they have curated from around the world. Some of their truffles feature 100 percent organic ingredients and they use chocolates that originate from Peru, Belgium, and more. Just some ingredients you can expect to find from Intrigue include basil, Jamaican hot chocolate, mahlab, gin, stout beer, cinnamon and raisins, coconut cacao, fennel seed, smoked salt, jasmine green tea and loomi, and Meyer lemon. The Truffle of the Month Club is available in six and 12 month subscriptions. The six-month option starts at $264, while the 12-month starts at $528. Each includes 24 truffles, wrapped in individual 12-count boxes. Want to share? One thing that makes Intrigue Chocolate Co. unique is that your 24 truffles come in two 12-count boxes. They are gift wrapped individually so that you can share one box with friends and keep the other all to yourself. We find the All Kosher Collection from Chocolate.org especially unique, because there are very few chocolate clubs out there that specifically cater to those on an all-Kosher diet. They worked with hundreds of chocolatiers and suppliers from around the globe to find the best-quality Kosher ingredients and varieties of chocolate. Even though it is all Kosher, it is not lacking in variety. Just some of the chocolates that are featured in this Kosher collection include Passover chocolate Matza, assorted truffles, gray sea salt caramels, truffle fudge bars, chocolate covered nuts and signature truffles. You must commit to a minimum of three months with the All Kosher Collection. Each shipment is $35 with free shipping and handling. You can expand the membership up to nine months if you wish. Every month just too much? Chocolate.org is one of the few monthly chocolate clubs that also allows you to change your deliveries to every other month instead of once a month. 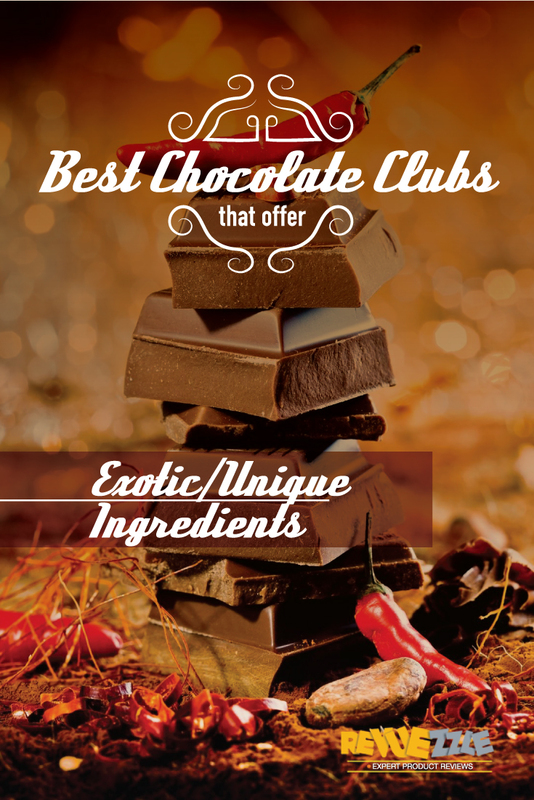 Visit Chocolate.org - 10% Discount - Get This Club! Pure Madness is all about highlighting the true flavor of chocolate – which we all know and love. They have some of the boldest, most exciting flavors that are all designed to complement dark, milk and other varieties of cocoa bean. Also, all of their chocolates are made without GMOs and they are Fair Trade Certified. Some of their chocolates do contain alcohol as well as seasonal ingredients – and definitely flavors that members may not see in any other chocolate of the month club. The price for Pure Madness is definitely high, but worth it to most that are seeking exotic finds. 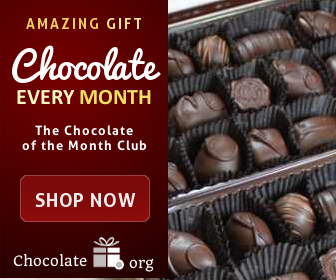 Their Three Month Chocolate Club starts at $175 total with free shipping. The selection includes a 9pc truffle, toffee, and 12 pc. exotic caramel collection. Want to experience even more? Pure Madness also offers a Six Month Club for those that want a half of a year full of chocolate delights. Visit Pure Madness - Get This Club!